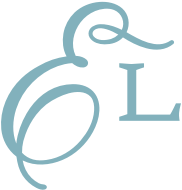 Celebrate National Embroidery Month and Embroidery Library's 17th birthday! 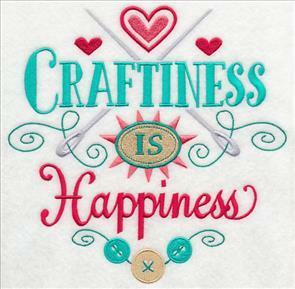 New designs are filled with the joy and love of sewing and embroidery. of the trade and supplies in fine form. 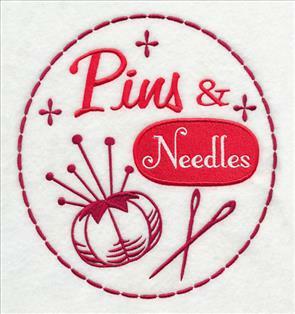 And, crafty little pincushions, made in the hoop, add personality and charm to your sewing space. Scroll down the page to see the variety! 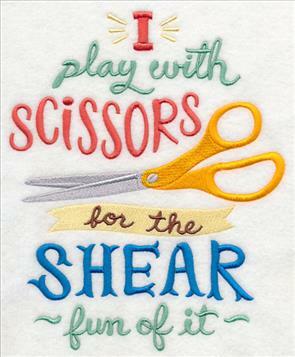 Sew savvy, and sew crafty. Enjoy these new designs! 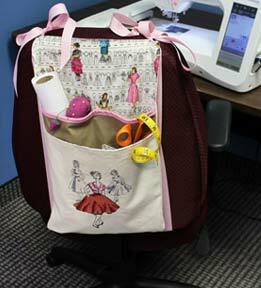 An over-the-chair organizer is an excellent addition to your sewing room. Click here for project instructions! These designs are inspired by classic pattern envelopes. 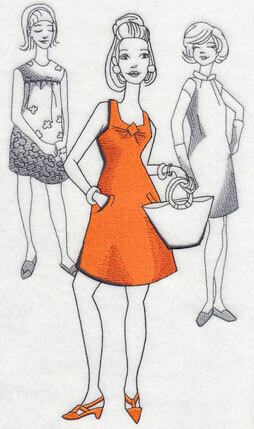 Bright and bold colors contrast beautifully with the sketched figures. These designs spread your love of sewing and embroidery to mini-quilts, tote bags, framed pieces and more! 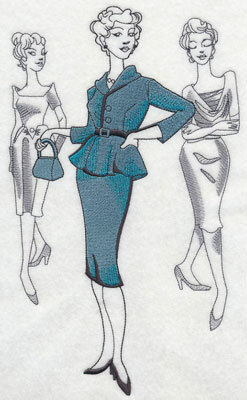 6.90" x 11.52" and 5.63" x 9.40"
4.67" x 7.80" and 4.10" x 6.84"
Four decades of fashion are represented in these designs. 30s and 40s are shown above; 50s and 60s below. 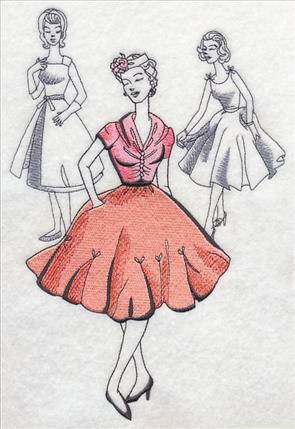 Hemlines rise, waistlines narrow, and skirts widen! These designs let you travel through fashion's history in fine style. 6.90" x 10.25" and 5.85" x 8.69"
6.64" x 11.75" and 5.31" x 9.40"
4.41" x 7.80" and 3.86" x 6.83"
An antique sewing machine gets a royal and elegant treatment in this design. 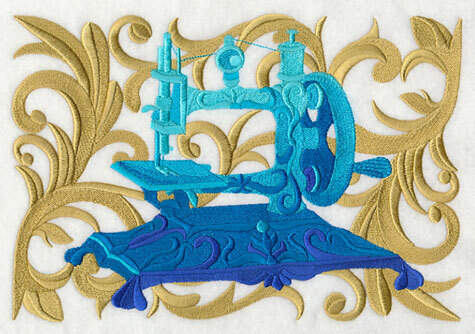 Beautiful baroque fills the background, and an eye-catching hues of blue transition the machine from bright to bold. 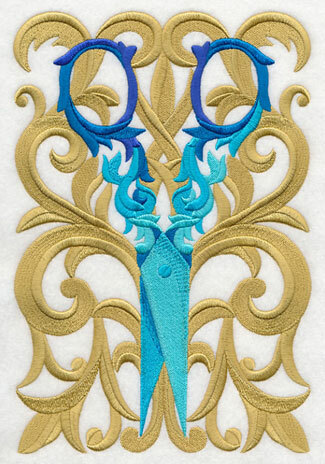 10.01" x 6.89" and 8.51" x 5.87" and 7.80" x 5.37" and 6.87" x 4.73"
Antique scissors are drawn and digitized in the same richly-detailed style as shown above. Pair together for a set of framed pieces, pillows, and tote bags! 6.90" x 10.18" and 5.87" x 8.66" and 5.29" x 7.80" and 4.66" x 6.87"
Essential sewing tools get a contemporary facelift. 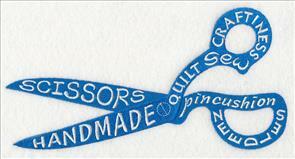 Silhouettes of an antique sewing machine and a pair of scissors are decorated with words and phrases. 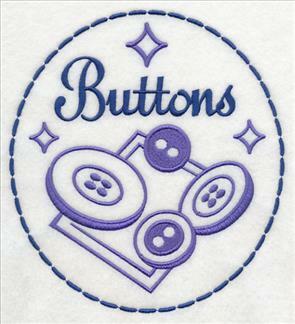 Add to shirts, sewing totes, and mini-quilts! 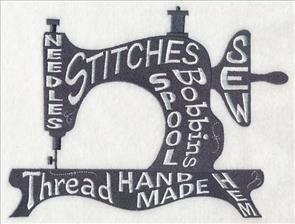 9.40" x 4.83" and 7.80" x 4.00" and 6.86" x 3.52"
When a dress form and thread spool are peppered with words, they speak volumes. Use all four of the designs to make colorful quilts, pillows, and medleys on tote bags. We stitched the samples with four different base colors. Experiment with different hues and colors to match your project and personal preference! 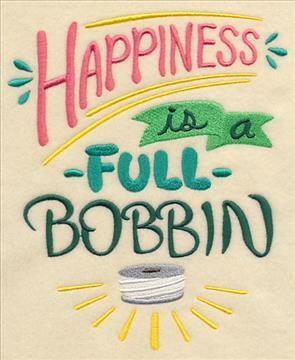 6.85" x 8.61" and 5.85" x 7.36" and 4.85" x 6.10"
Sewing and embroidery enthusiasts will adore these clever designs! The lettering styles are lively, and the colors are bright and eye-catching. 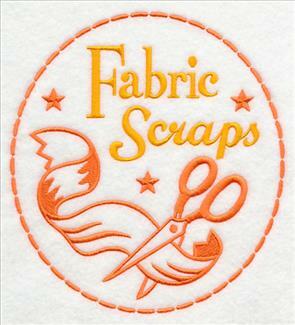 Stitch the designs onto shirts, totes, and framed pieces to brighten up your sewing space. 6.45" x 7.81" and 5.85" x 7.08" and 4.85" x 5.87"
in colorful medleys. 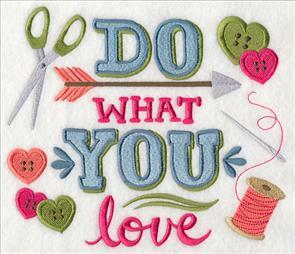 Stitch these designs and celebrate your passion for sewing and embroidery! 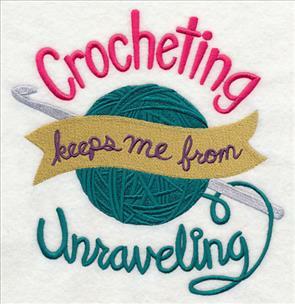 Knitters and crocheters love roomy tote bags for carrying yarn, needles, and patterns. Dress up those tote bags with these fun sayings! 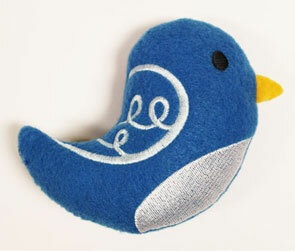 Stitch onto pillows and mug rugs as gifts for your sewing and crafting groups, too. 6.89" x 7.13" and 5.87" x 6.07" and 4.87" x 5.04"
These handy labels make organizing a breeze! Each is designed in a retro style with sleek and energetic lettering styles. 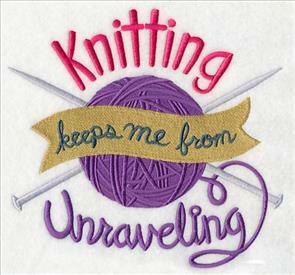 6.91" x 7.53" and 5.86" x 6.39"
6.90" x 7.52" and 5.86" x 6.39"
4.86" x 5.30" and 3.55" x 3.86"
Embroider these designs and use them to label drawers, storage boxes, bins, and pockets. 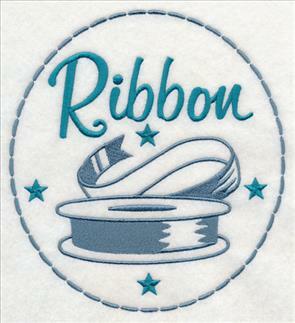 We stitched the designs below in blue and teal, but choose colors that coordinate with your sewing room decor. 6.90" x 7.51" and 5.86" x 6.39"
These designs are a wonderful way to spice up your sewing space, and keep items organized, too. 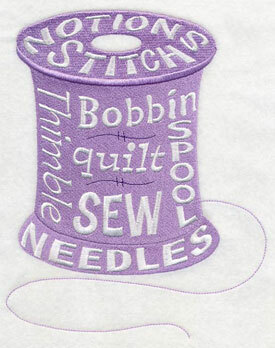 And, you can also use them to make a sewing-themed quilt, pillow, and wall hanging! 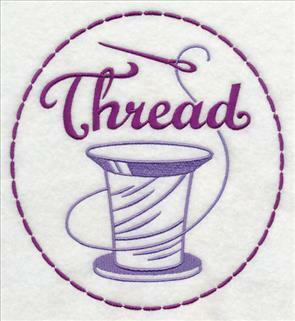 Organize your sewing room with these quick-stitching labels! 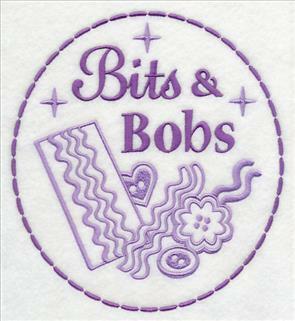 Embroider onto fabric, then use to mark drawers, bins, storage boxes, and pockets. The six labels are available in a design pack! Crafty Pincushions, Made in the Hoop! New pincushion designs are made right in the hoop! These creations are filled with color, charm, and personality. 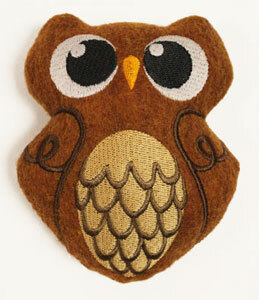 The sweet little bluebird has whimsical detail on his wings, and the owl has a friendly face. They're wonderful for storing sharp and shiny bits. These project instructions show the steps. 4.50" x 5.22" and 3.32" x 3.85"
Cupcakes and strawberries add a sweet look to your sewing room. 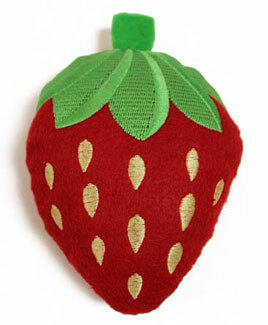 These pincushions are made with small pieces of felt. 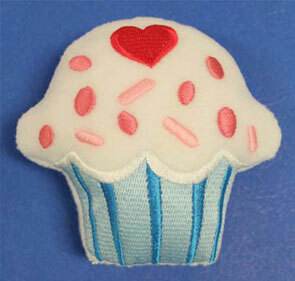 Choose different colors of felt for different flavors of cupcakes! 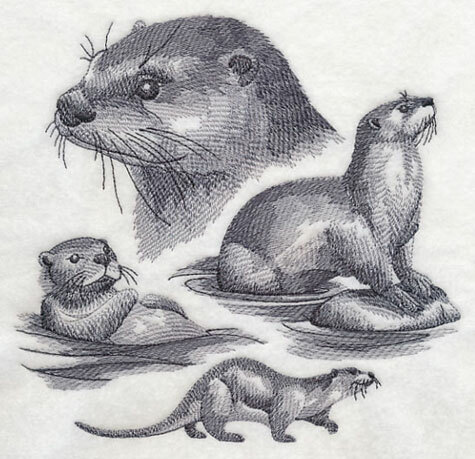 4.50" x 5.19" and 3.34" x 3.85"
Sea otters are playful creatures, and it's a joy to watch them frolicking in the water and waves! 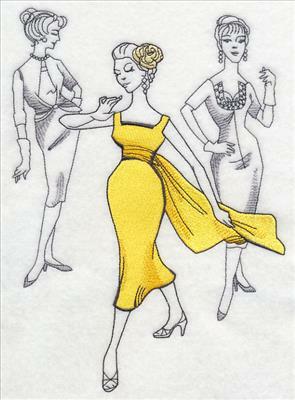 Barbara and Theresa both wrote to request sketch medleys of these graceful creatures. Sketch-style designs are light, with some open areas. They're beautiful additions to smooth fabrics, like linen, quilter's cotton, Jersey knit, and sweatshirts. Thank you, Barbara and Theresa, for your suggestion! 7.33" x 6.90" and 6.28" x 5.88" and 5.17" x 4.87"